Oatmeal is known for its beneficial nourishing and soothing properties and it still remains as a very popular natural skin care ingredient. Oatmeal is great for exfoliating your face (because of its grainy texture) and for the preparation of homemade face masks; oats can effectively absorb and remove the dirt and impurities from skin surface. 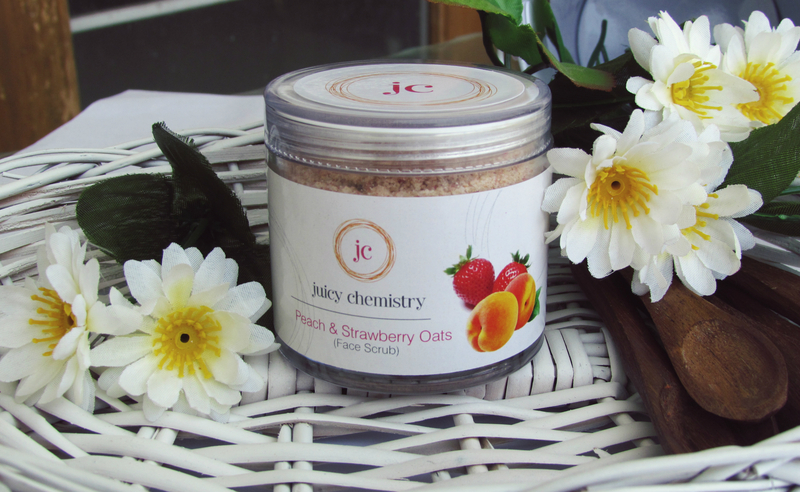 Natural Scrubs made with Oats mixed with other fruits can help treat many skin conditions, as well as rejuvenate and sooth dry and itchy skin; Today I am reviewing a facial scrub from Juicy Chemistry – Peach & Strawberry Oats Face Scrub which suits even the sensitive skin. Picture itself look so tempting right! 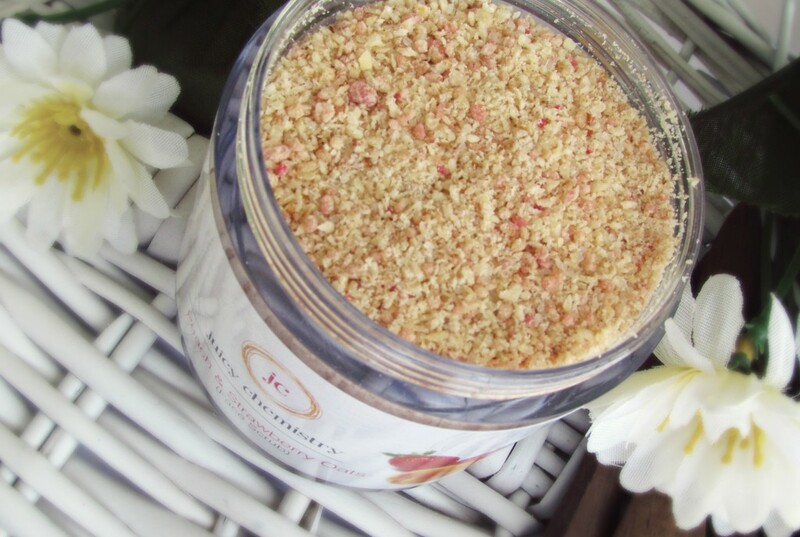 This scrub is made of oats, peach & strawberry. Product claims : Improves skintone and texture. Fights dull and flaky dryness. Absorbs excess dirt, oil and bacteria. I am a big fan of natural skin care products. First thing I noticed about this product is how wonderful it smell. After a tired day @ work, this is so awesome to use. I used this during my stay in Kerala. I mix this with water to make a thick paste. 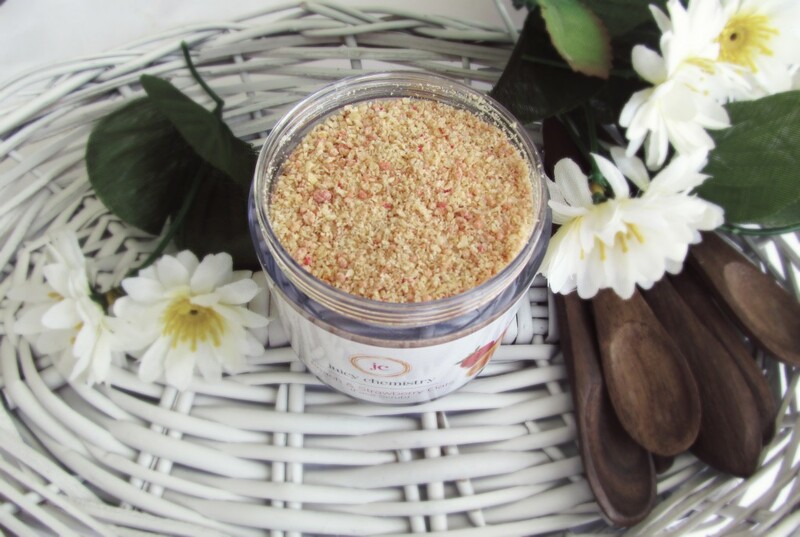 Gently, in circular motions, massage your clean face with this scrub to exfoliate your skin; massage for 1-2 minutes, avoiding the eye area. Rinse with warm and then, cold water (cold water will help close your pores). I loved the strawberry + peach smell it has and it really made my face soft and clean. Scrub is not harsh at all. As it has no harmful ingredients – Its completely safe to use everyday too. If used everyday, A tub lasts for more than a month. My skin never felt dry after using this. I am not saying it improves skin tone and all..However, my skin never had any breakouts or something . It’s a nice everyday scrub. Use a wooden applicator to take the product each time. This ensure the products remain fresh. It’s safest to take the products with an applicator. Follow Juicy Chemistry here for ordering the products. Juicy Chemistry Ships worldwide. If you decide to order and don’t know which products suit your skin type, You can direct message Juicy Chemistry, The Wonderful Megha Asher will respond to all your queries and help you choose the products that best suit your skin type. **Products send by the brand. However my review is honest & unbiased as always. It is !! Do try them!